I learned a few things during our last group camping trip about getting kids to help out with chores. The kids as usual took off to go play while the Dads set up their respective campsites. Everyone tried to get their kid to help set up. Most the time the kids would hangout for awhile, then lose interest. Dad: can you stop playing around and help out! Dad: Stop playing with the tent poles you’ll break them. I saw this play out at every other campsite including my own. I decided to change tactics. I broke down each large task and explained why I was doing them. I had my son tackle one small task at a time giving him positive feedback when each was completed. As the ground cover blew away I told him to find some big rocks to hold the corners down. Then I put him in charge of putting the tent stakes in the places he thought they needed to go. Lastly, I had him CAREFULLY put the tent poles together while I spread out the tent. Before long we were all set up and as a reward I told him to go explore a bit while I got lunch ready. When I ask my son to help out, I try to be specific about each task until he learns each step and can do things independently. Checklists help until things become routine. Eventually, your kid learns to execute complex tasks and do them independently. Try this yourself and share your results. A few of you may have an aversion to camping. More than likely it was caused by the idea that camping has to be uncomfortable, unpleasant and boring. If you put yourself in your child’s shoes camping means no video games, tv or Internet. Depending on the age of your child these might be deal breakers. My son and I have been on several camping trips. Most of them car camping where we could bring our toys and comfort items with us. Out last trip was his first introduction into backpacking. I saw this as my chance to show him how much fun this type of camping can be. At the time of this writing, he is 8 years old. At this age, he still wants to be like daddy, so I got him his own pack and made sure we had some comfort items and food that he liked. It added about 15lbs to my pack but it pretty much made the trip for him. Did I forget to mention he likes fishing? I made sure to bring my backpacking fishing rod, s’mores stuff and enough instant hot chocolate to give a Boy Scout troop diabetes. I also brought his favorite food…bacon. 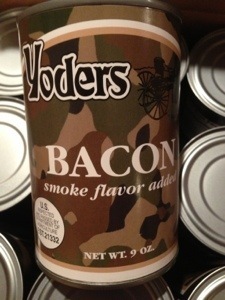 Its my secret weapon on my backpacking trips, yoders canned bacon. I always made sure he had something to look forward to while we were camping and gave him space to explore. We even caught a fish and ate it which made his trip. As he gets older, he will be responsible for his pack and comfort items that he decides to bring but it think this first trip planted the seeds for future great backpacking trips with my son.